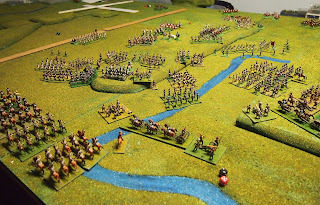 Another post around the 201st anniversary of Borodino. 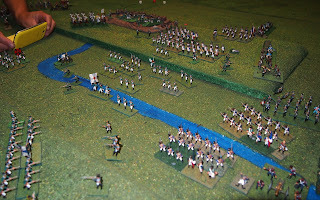 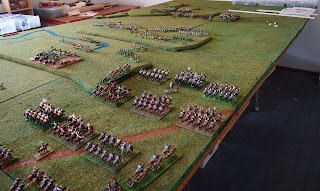 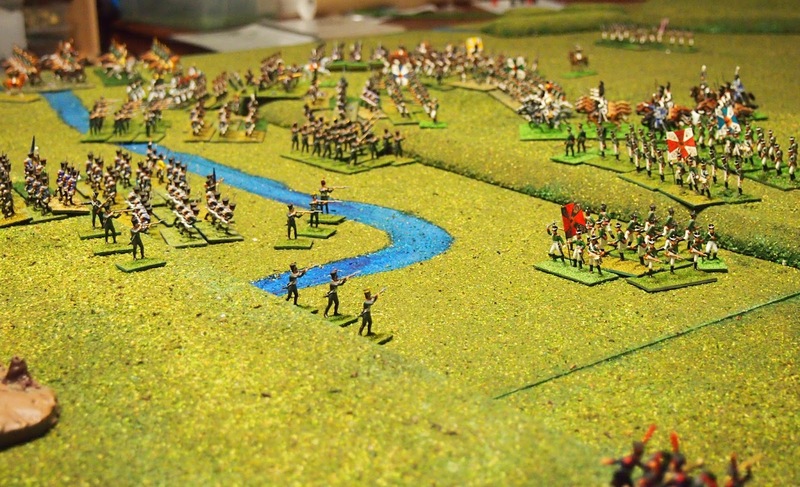 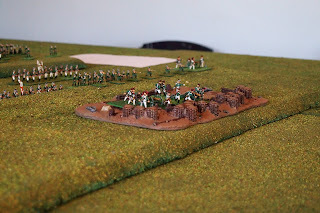 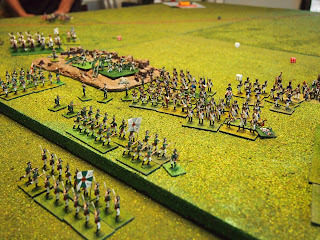 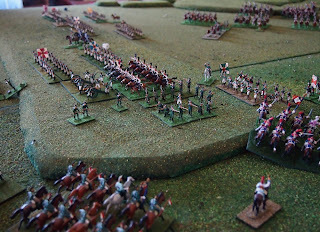 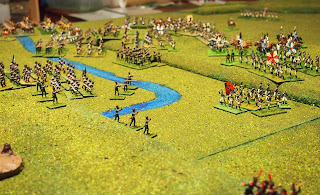 It was interesting and somewhat strange to do only a section of the battle having relatively recently completed our bicentennial game of the whole thing. 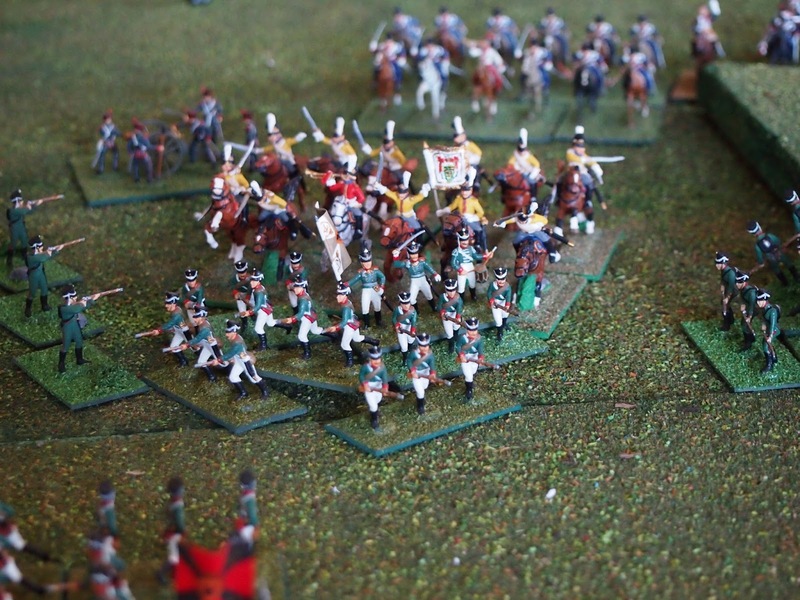 This is a pictorial report of what was a close-fought and enjoyable game. 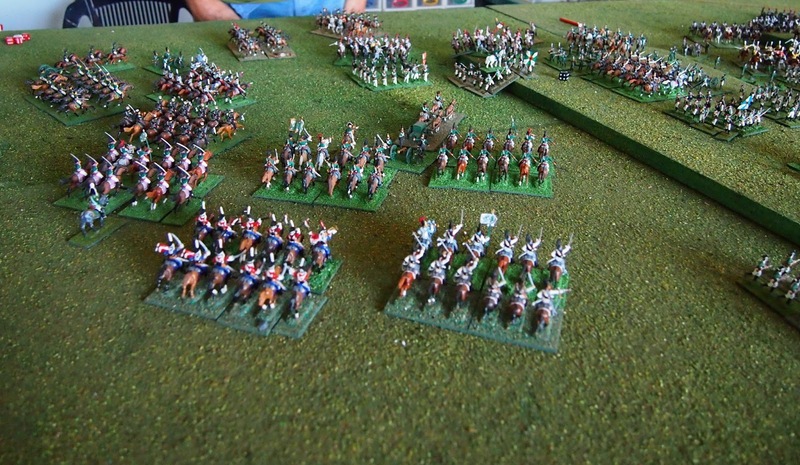 Massed French-Allied heavy cavalry; marvellous. 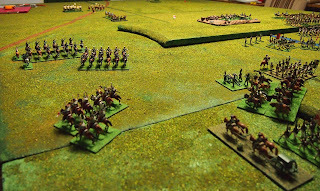 Caulaincourt with II Reserve Cavalry Corps to the front and Latour-Maubourg's IV Reserve Cavalry Corps behind them. 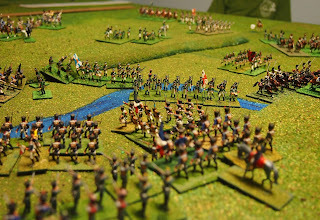 What remained of Eugène's IV Corps, after the morning's fighting, formed the French-Allied left. 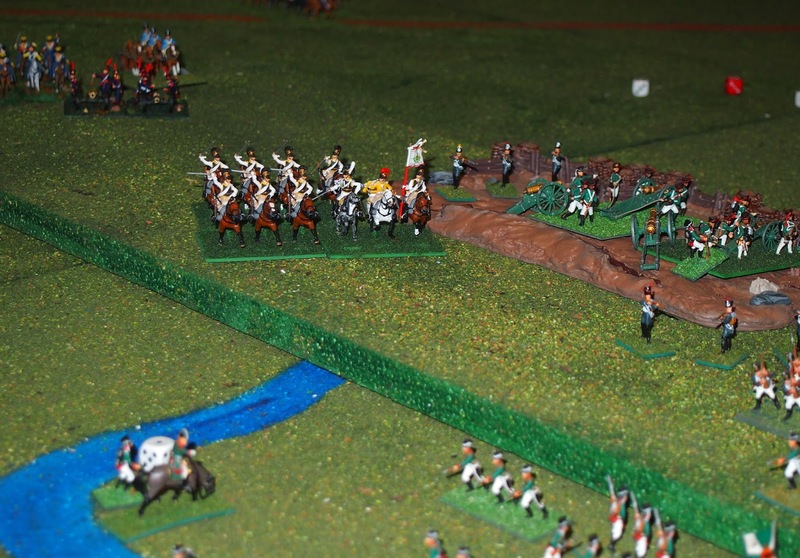 The Russian defenders were deployed behind the Grand Redoubt, with the latter occupied by its batteries of 12 pdrs. 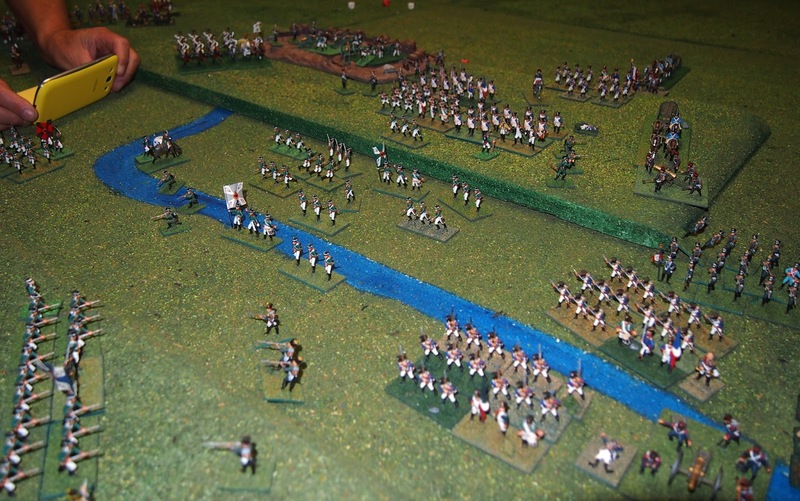 The French-Allied forces moved up in force. 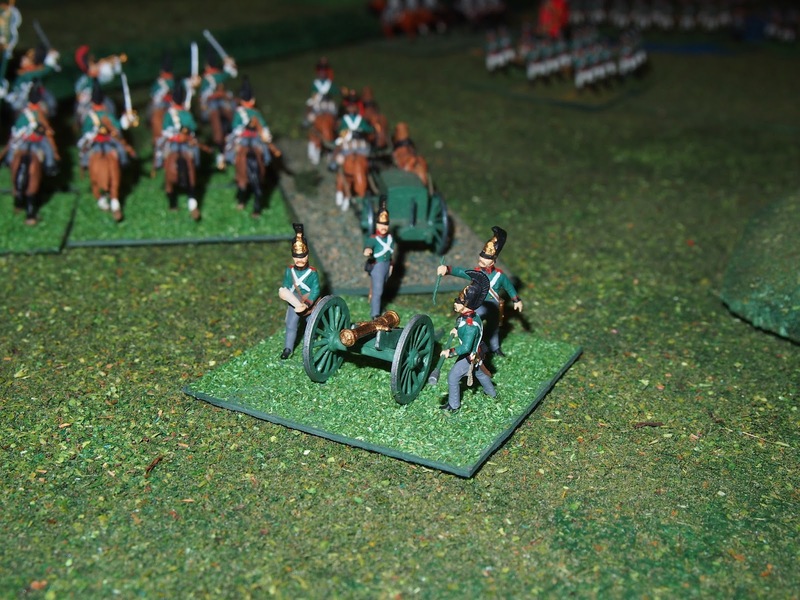 As the French-Allied attack came on in force, the Russian guns fired; sans effect. The Russian guns finally hit some targets as the Caulaincourt's heavy cavalry swept around the ridges and Eugène's infantry attacked around the north-west flank of the redoubt. 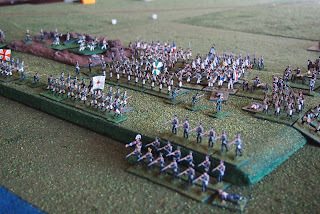 More French casualties from Russian guns. 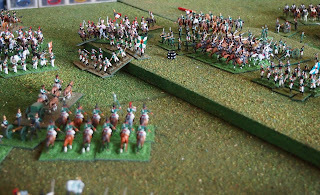 The carabiniers were particularly ravaged. 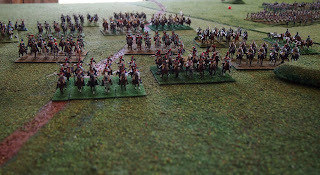 The attack of the leading French-Allied units went in. 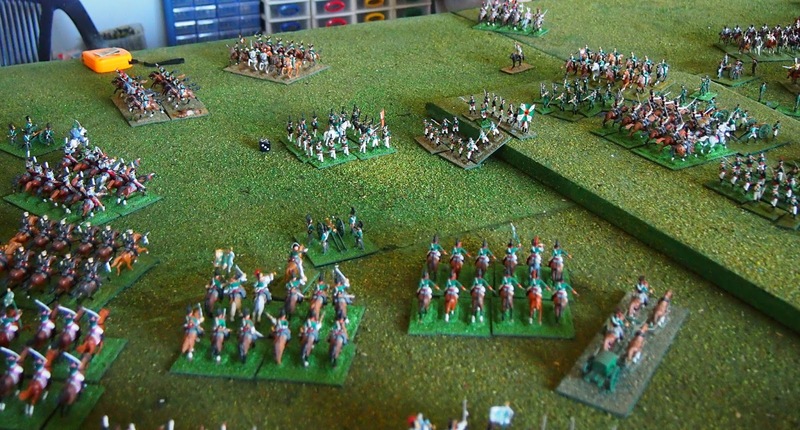 Grouchy's cavalry arrived in the north-west, behind Eugène’s infantry. 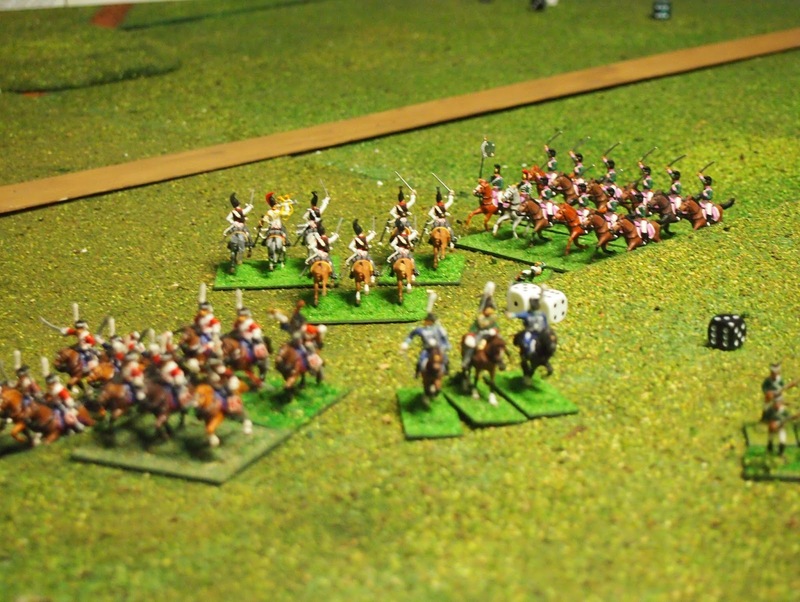 Likhachev's battery failed to ‘damage’ the Saxon cuirassiers who were charging them. 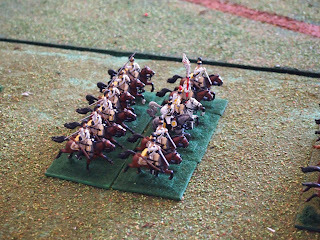 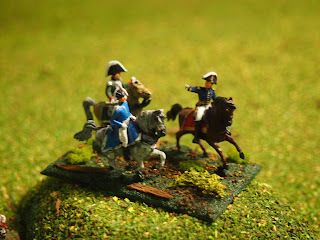 The cuirassiers destroyed the battery. Gerard's division assaulted the redoubt, the 1/21e were broken. 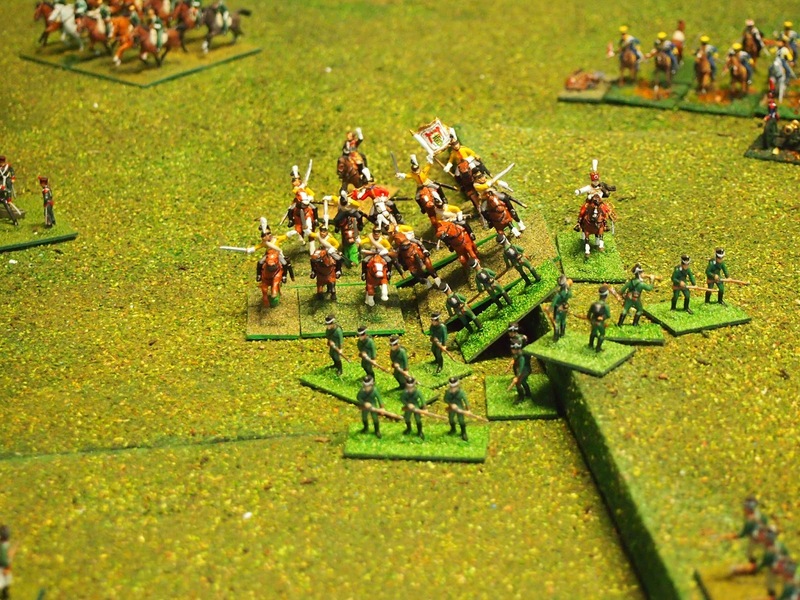 Caulaincourt’s carabiniers attacked square of jägers and were broken in the attempt—not having a good time of it them! 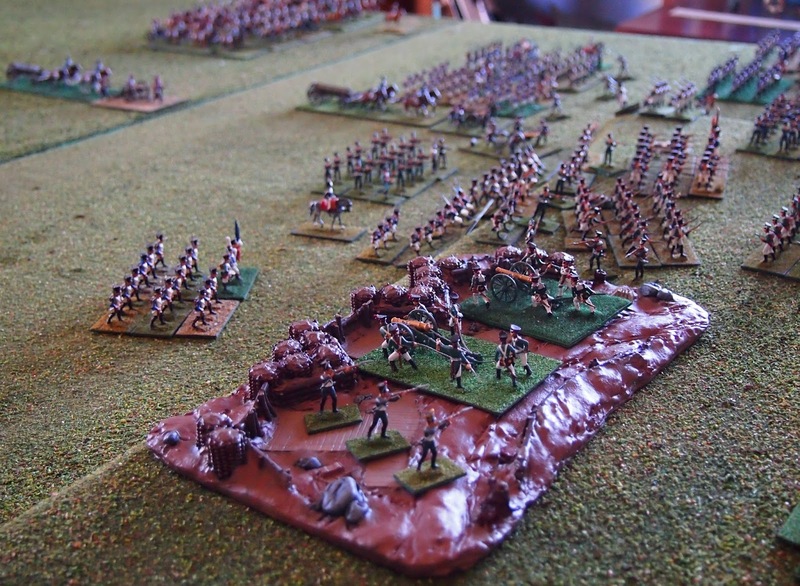 A big turn with generally poor results for the French-Allied forces. 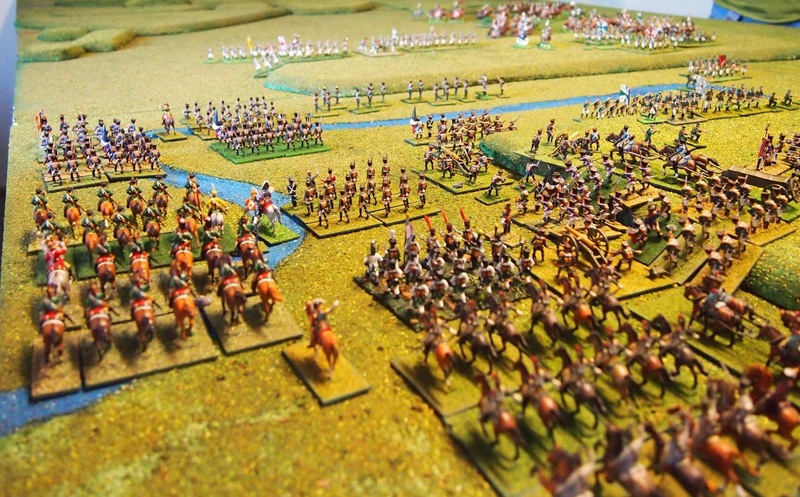 Gerard's division began the attack on Likhachev’s troops, coming around north-west of the redoubt. 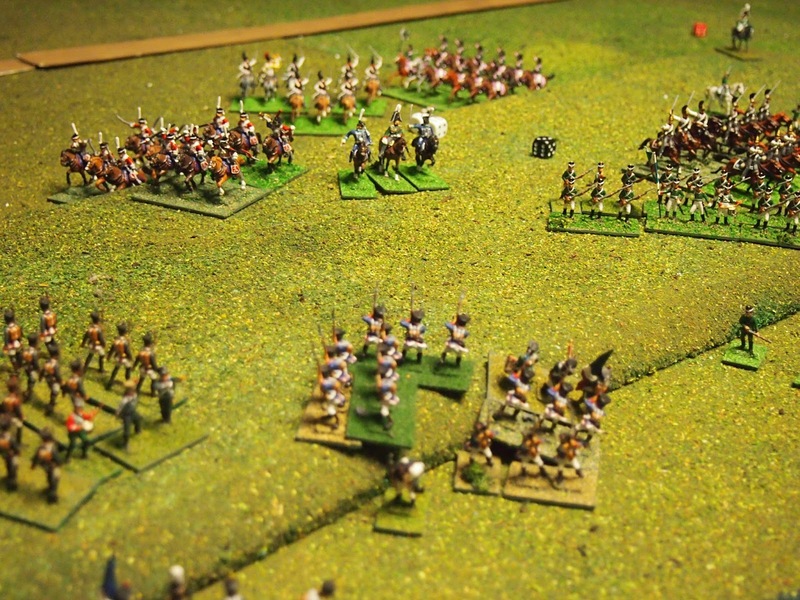 The first charge by the French infantry was stopped by Russian fire. 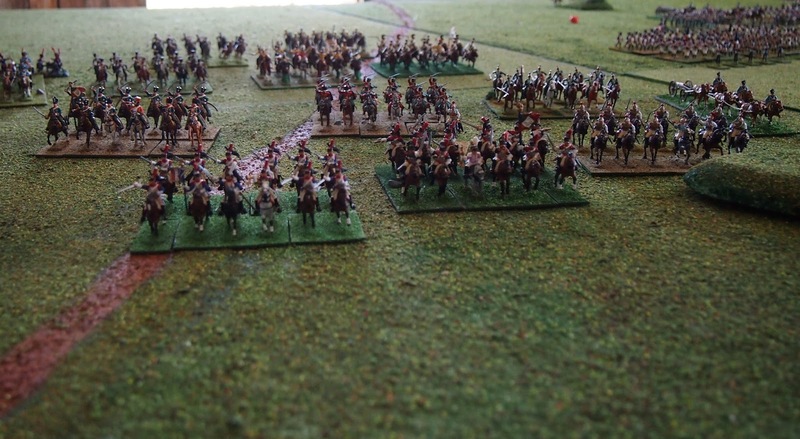 The 5th cuirassiers charged the square of the Rilsk/Ekataterinburg infantry and were pushed back with heavy loss. 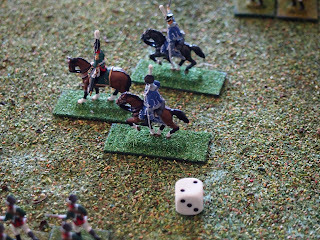 Worse still, the 8/10th cuirassiers attacked the square of the Seleguinsk/Kopor regiment, were pushed back in mêlée and taken off table, so lost—ouch! 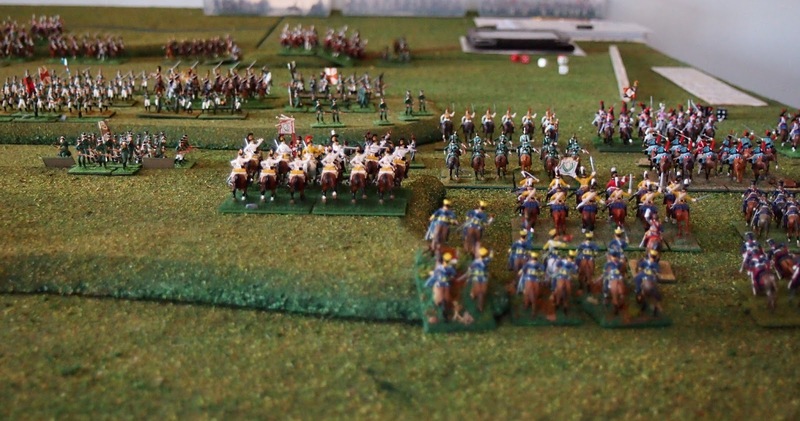 Not surprisingly, Calaincourt's corps was demoralised. 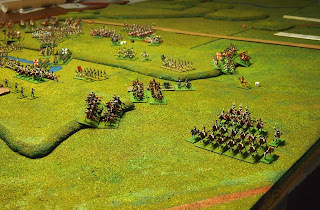 Gerard's infantry pushed back the Tomsk regimentt from the first line on first ridge. 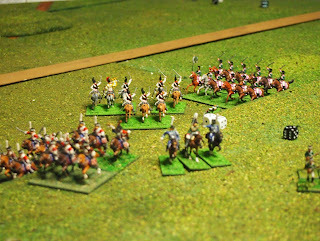 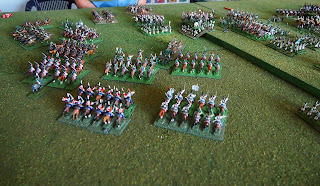 Calaincout's demoralised cavalry changed several units and failed combats. 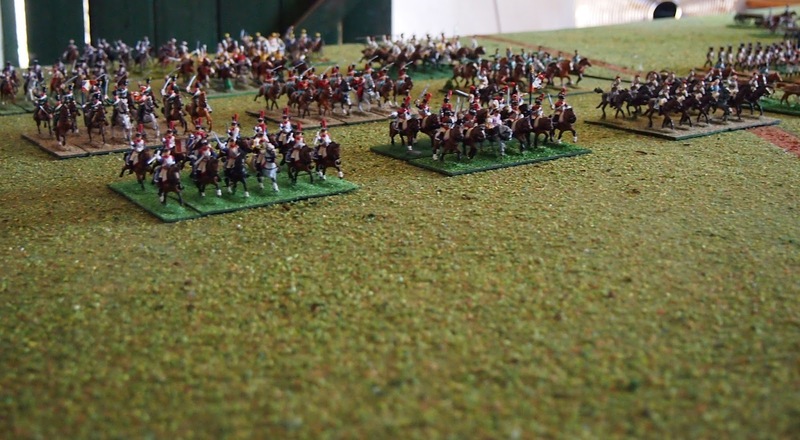 The Chirvan regiment formed square when charged by Latour-Maubourg’s Polish lancers and pushed them back. 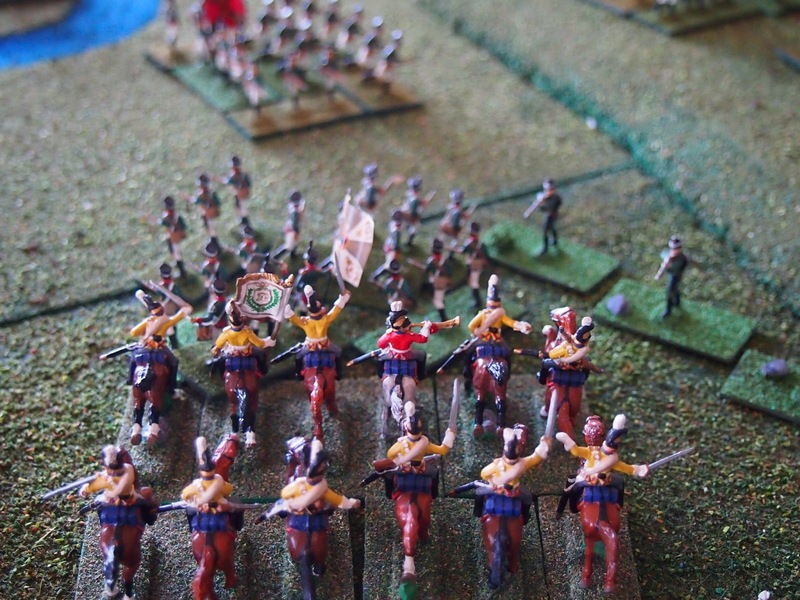 Grouchy's cavalry advanced around the French-Allied left flank. 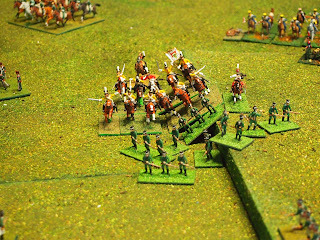 Saxon Garde du Corps broke square of 19th jägers. 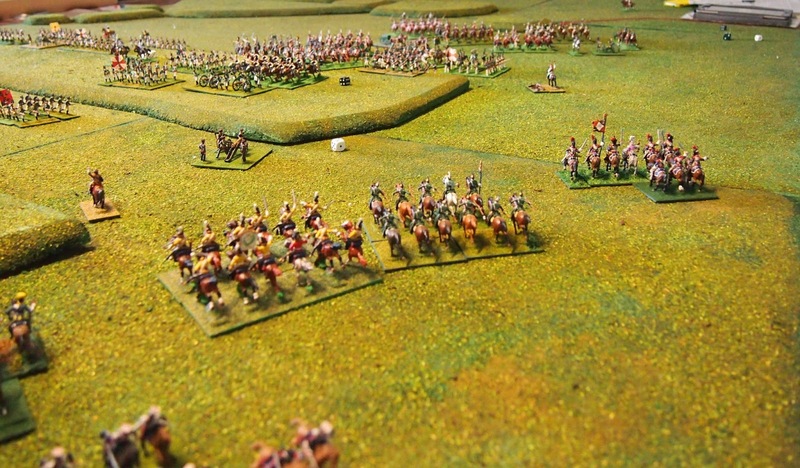 The Bourtirki regiment pushed the back attack from infantry of Gerard's division, but Likachev’s division was demoralised. 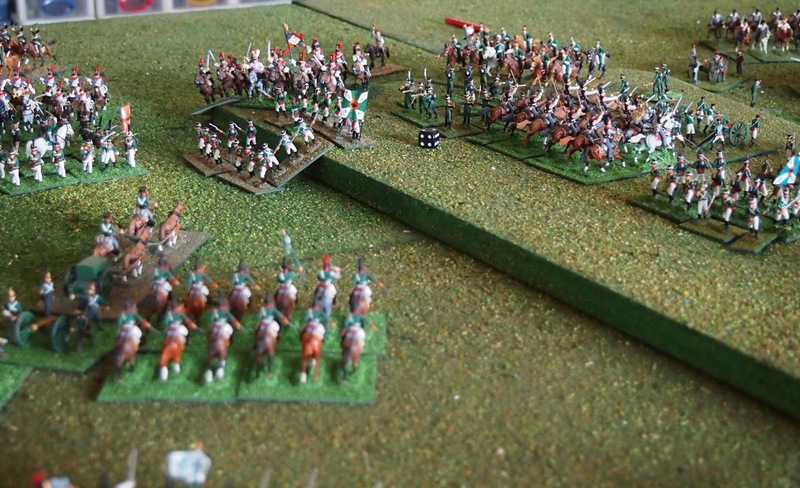 The Saxon cuirassiers returned to the fray, breaking the square of the Chirvan regiment from Likhachev's demoralised division which failed 1/2-strength morale and broke. 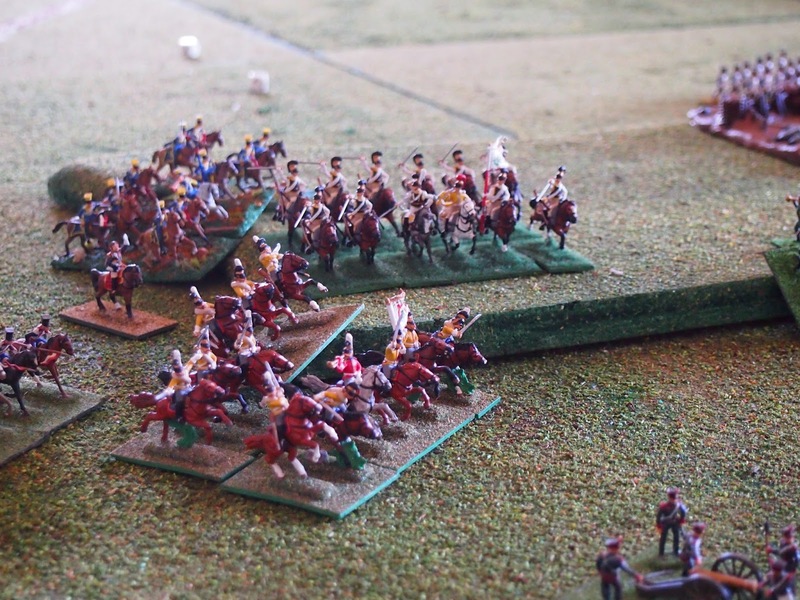 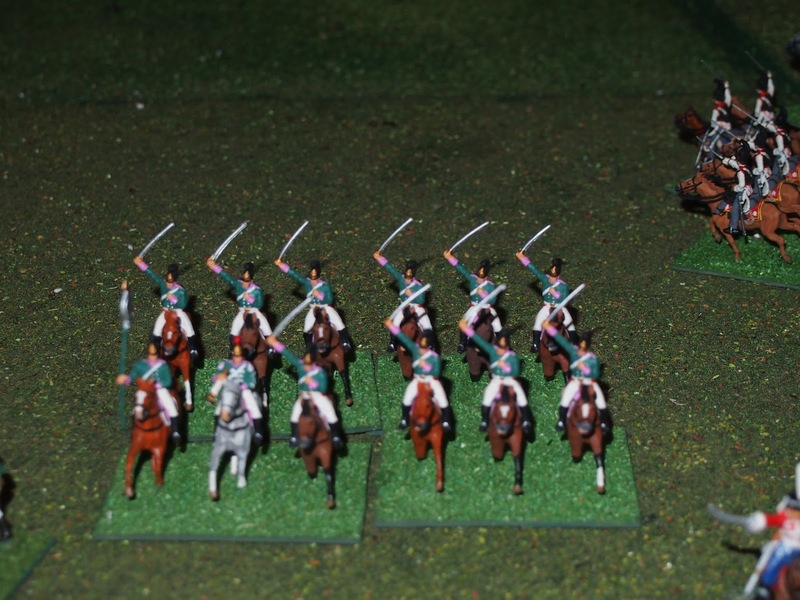 Sumskii hussars broke the 5th cuirassiers from Caulaincourt's demoralised command which was in turn broken. 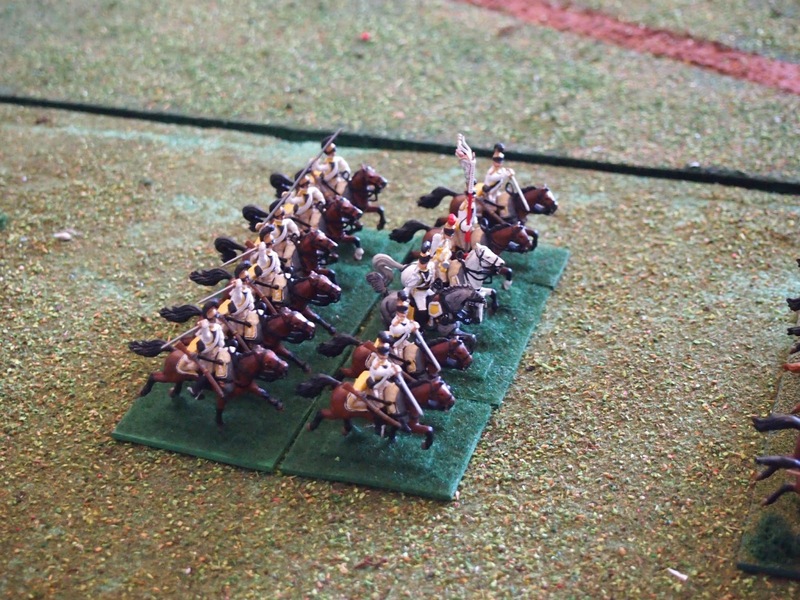 On the Russian right, Kapsevitch's Moscow regiment was beaten in mêlée and broken. Kapsevitch's division retreated. 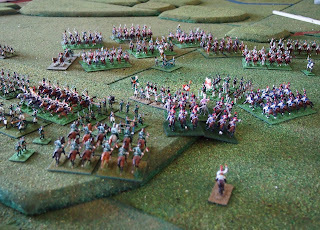 Broussier's 9e ligne advanced towards the Chevalier and Horse Guard cuirassiers to protect the retreating 2/13e légère of Morand's division and to give them time to retreat. 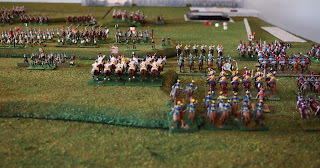 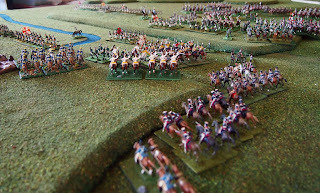 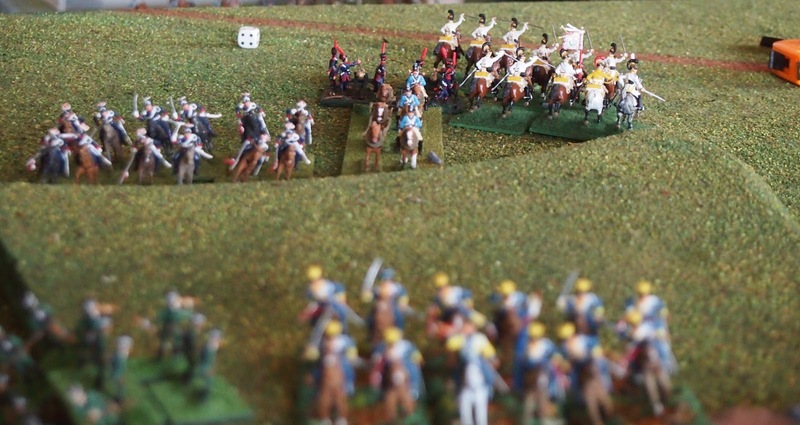 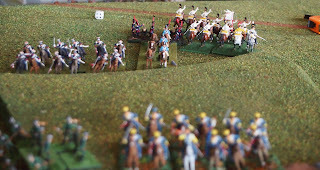 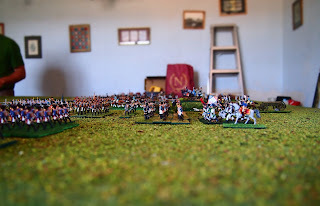 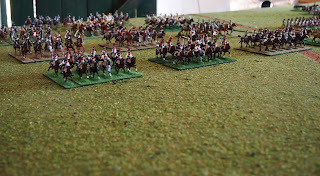 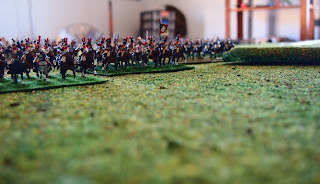 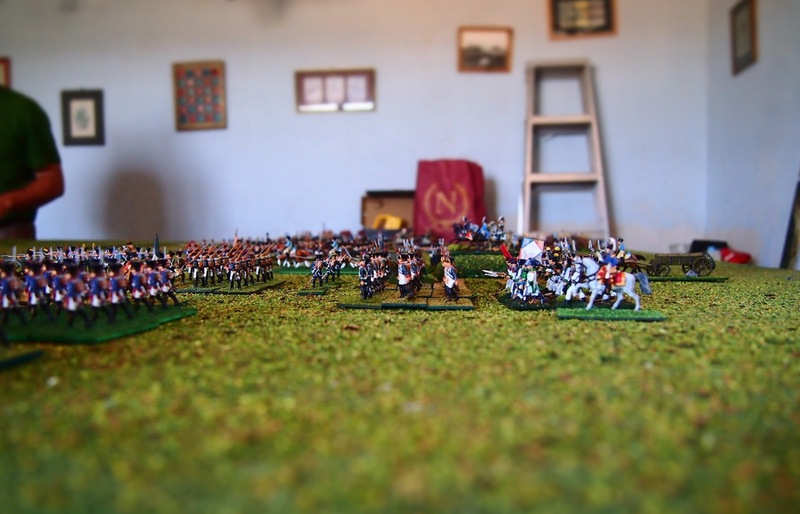 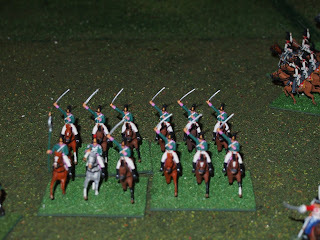 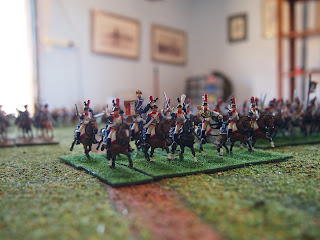 They were charged, formed squared and defeated the cuirassiers with a nasty bloody nose! 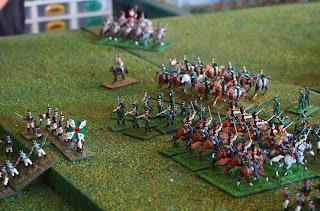 Kreutz's dragoons attacked the 3rd Polish lancers and broke them. 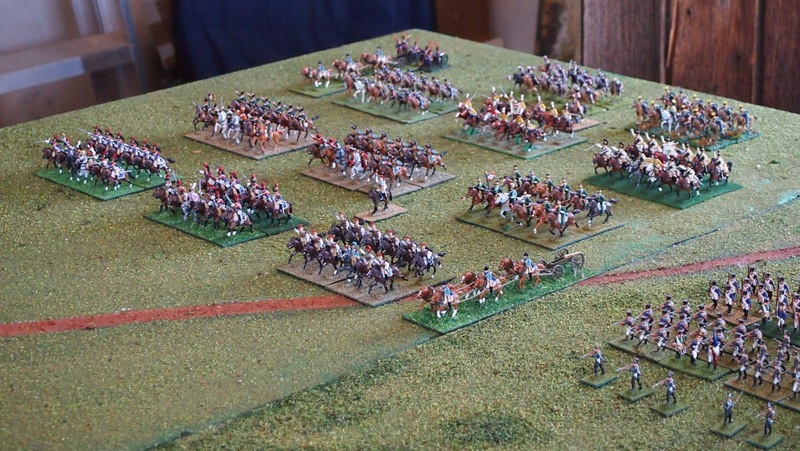 Korf II's cavalry attacked around left and right flank of Tolstoy's division. 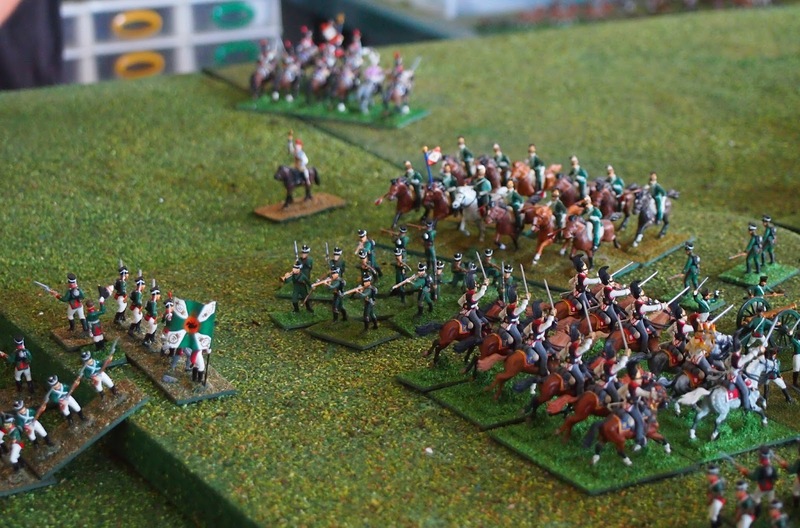 The 15th Polish lancers from Latour-Maubourg’s corps charged Kreutz's horse battery, both fought until broken! Latour-Maubourg's corps failed morale at 1/2 strength and the two Saxon units and Westphalian artillery which remained retreated. 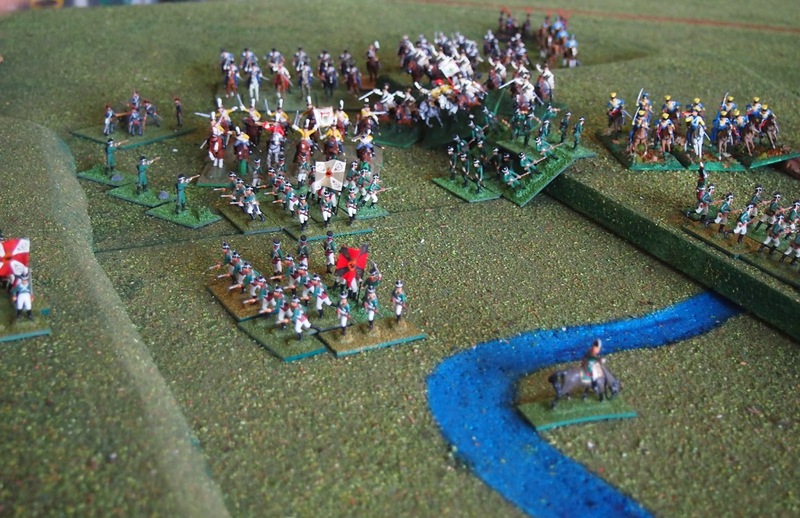 The Russians launched a counter-attack by Korf II and Tolstoy to regain ground on the ridges, but there was no further combat. The result was a draw by battlefield situation, but a Russian victory by scenario. 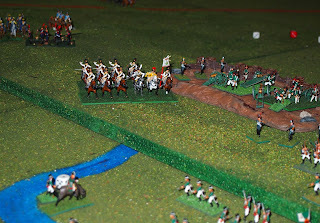 Julian and Mark (French-Allied) had given it everything and Stephen and I (Russians) were happy to take that result! 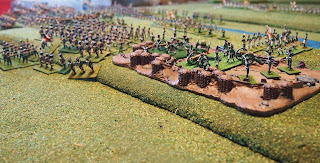 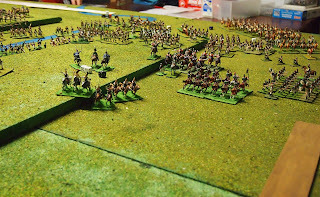 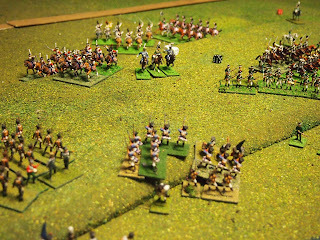 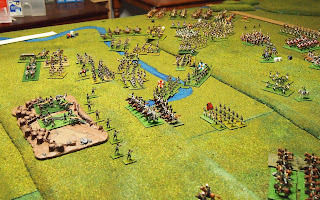 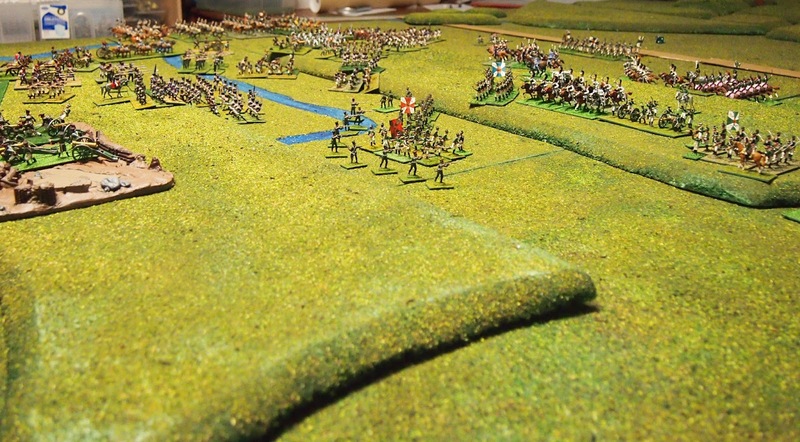 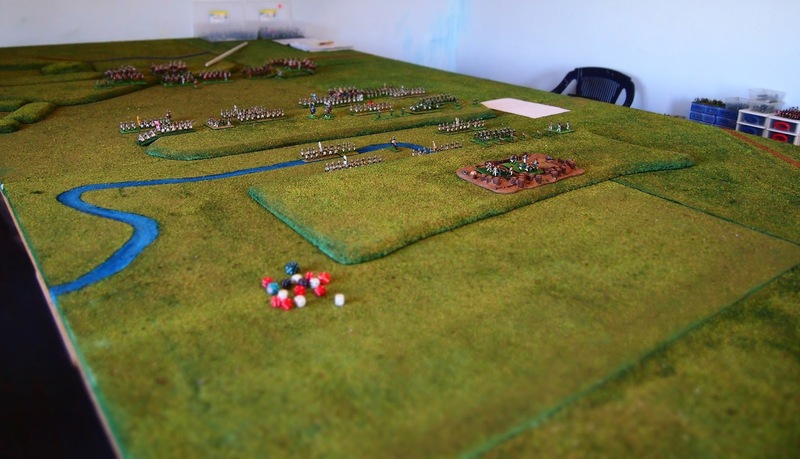 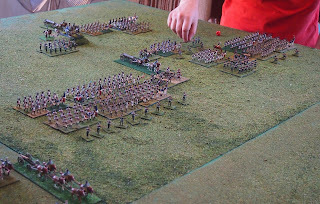 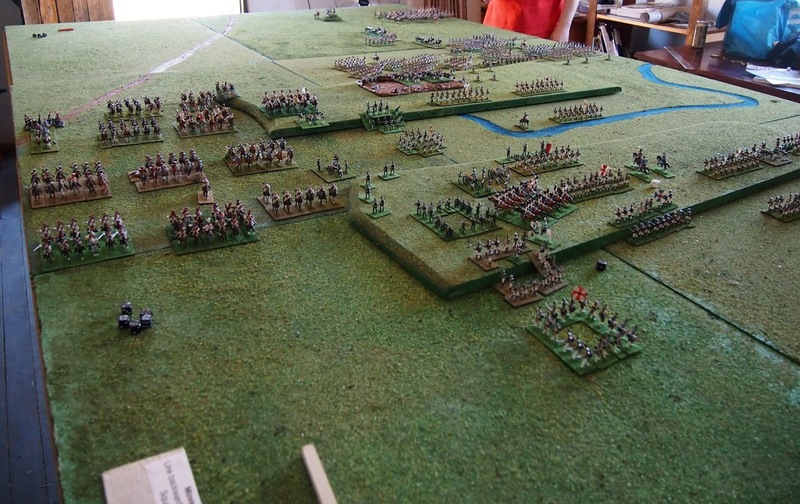 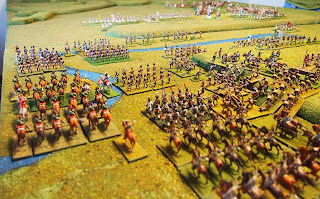 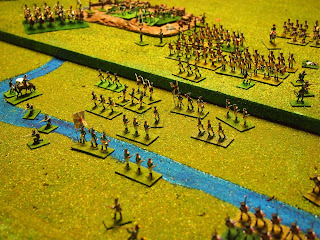 If we played this scenario again, we'd modify the victory conditions as the need to capture the rear ridge line makes for a slightly ahistorical version of this section of the battle. 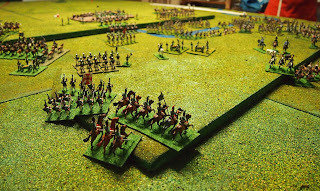 James - I just love the shots of your games in progress, inspiring stuff! 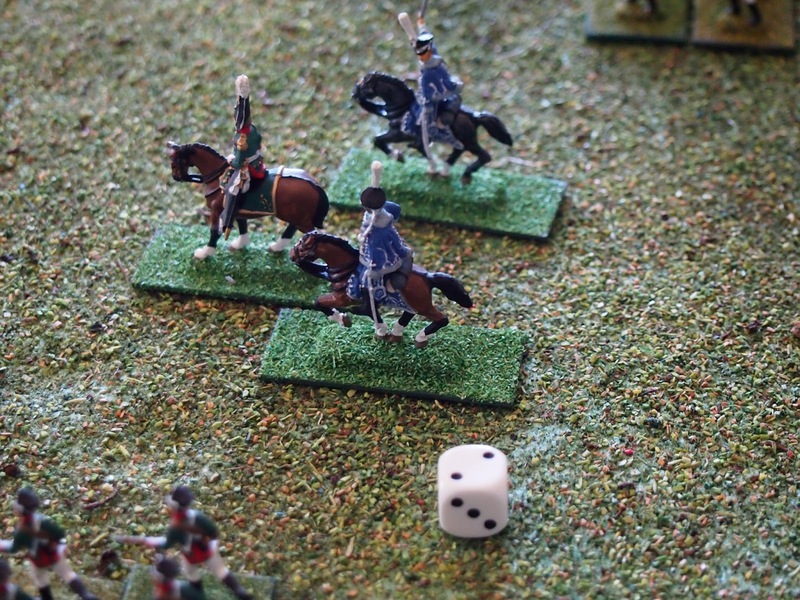 Thanks for the encouragement Ian. 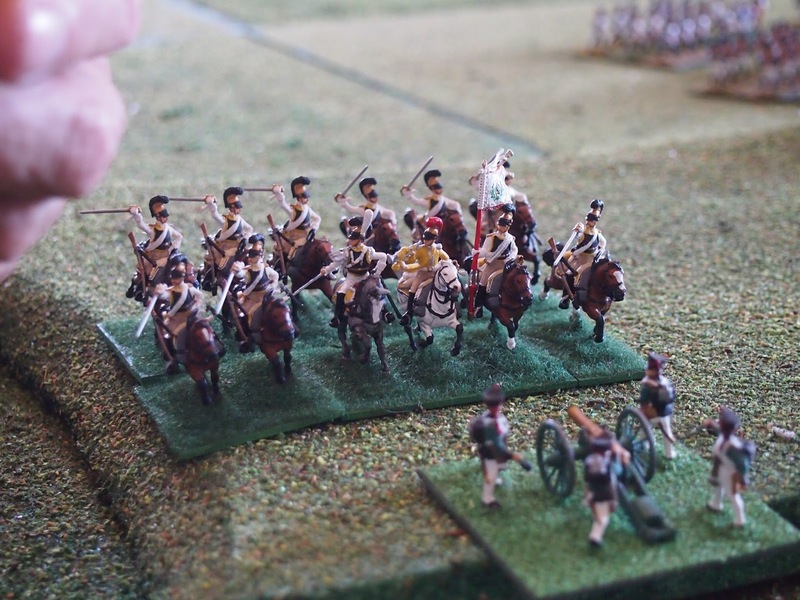 It's great to share our fun with others who like to see it! 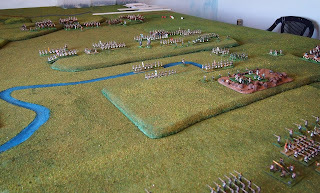 We are pleased that you liked it Sedgemoor, thanks for "dropping by" and for the supportive comment. 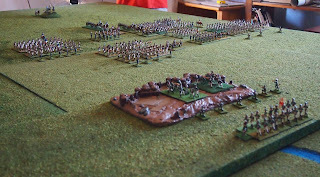 Base sizes are pretty flexible, within reason, as the rules focus on 'units'. 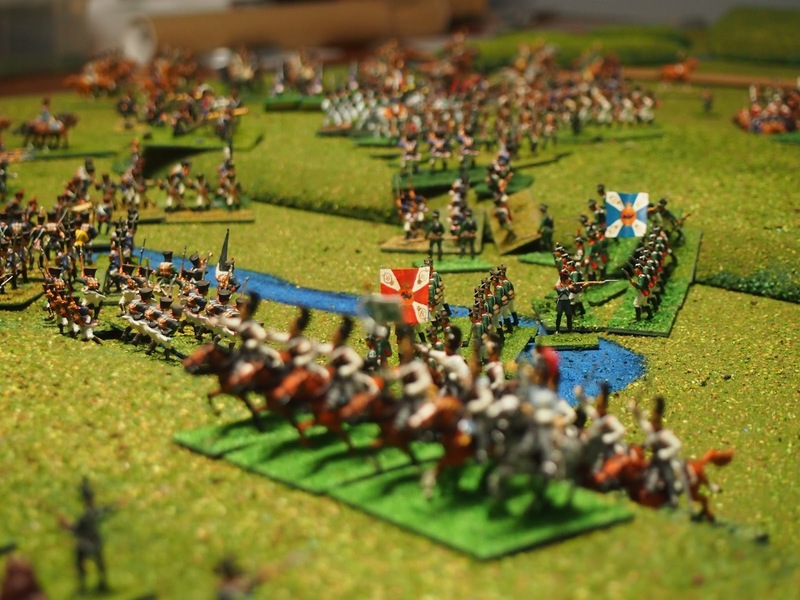 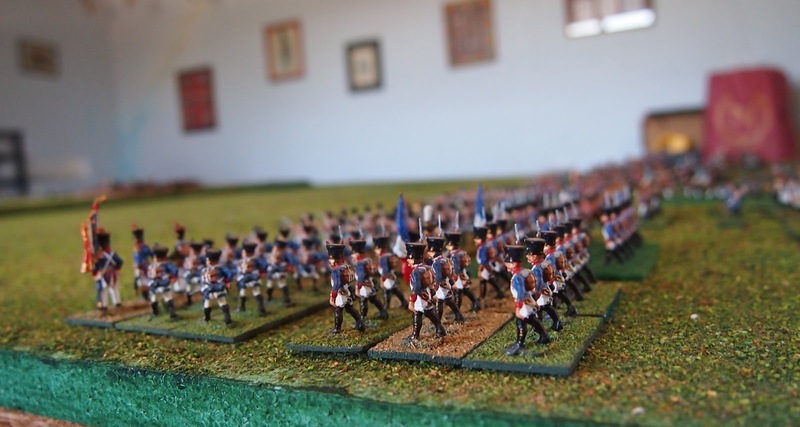 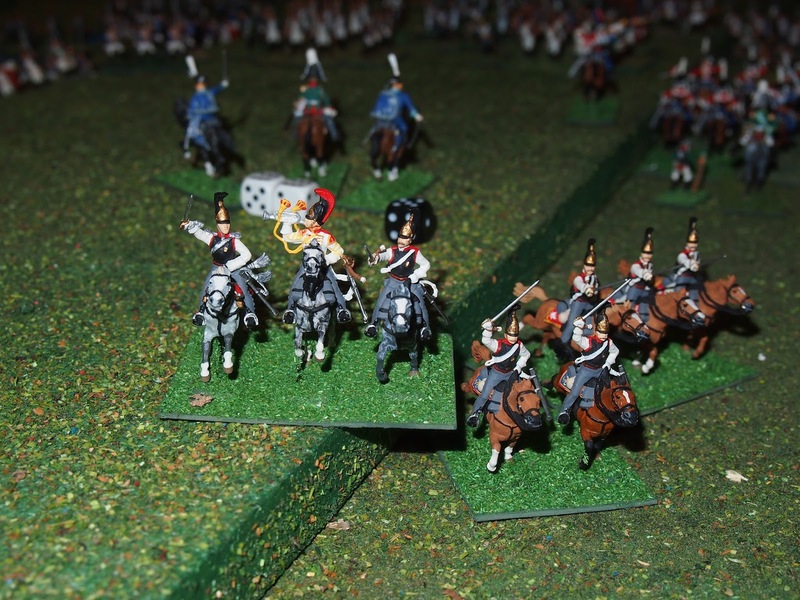 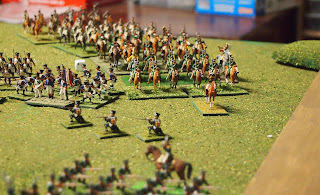 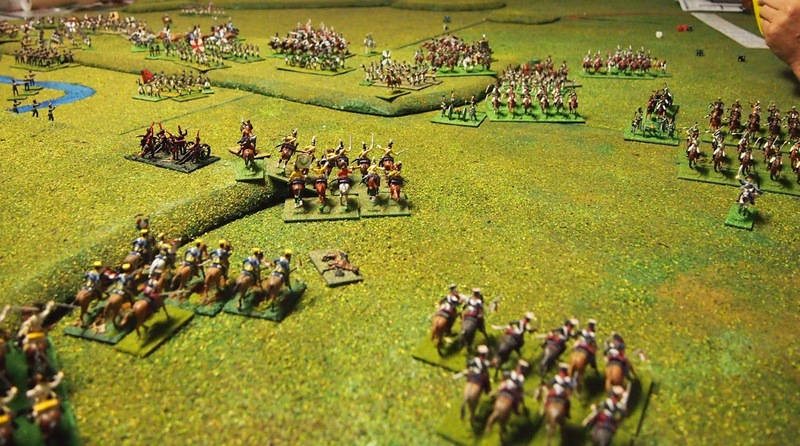 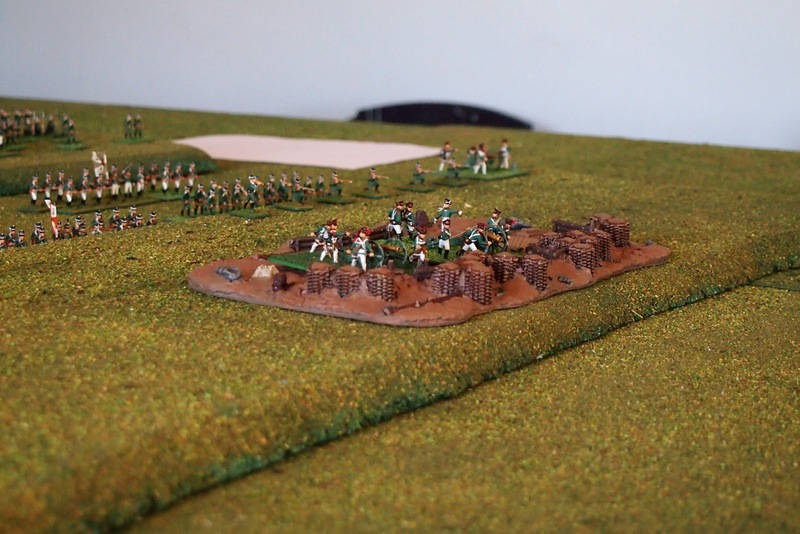 Ours are based about the same; 40 mm wide x 45 mm deep for two cavalry figures; 45–50 mm x 22.5 mm for three infantry figures and 60–80 mm wide x as needed (from 60–80 mm) for one or two gun models and 5–6 artillerists. 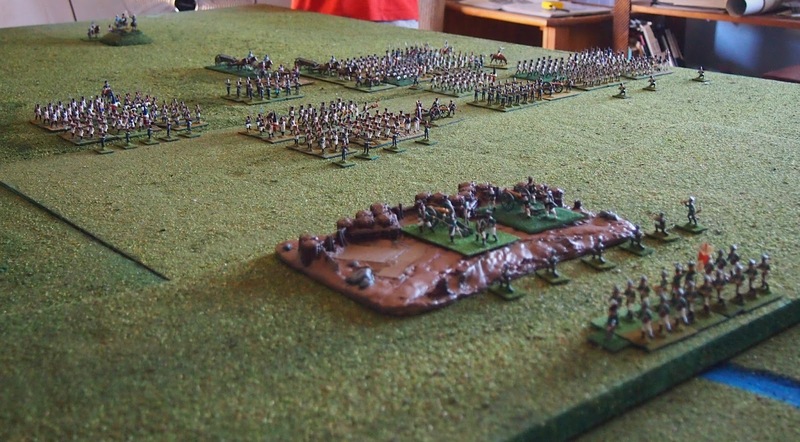 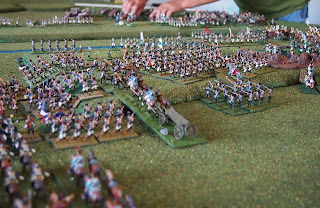 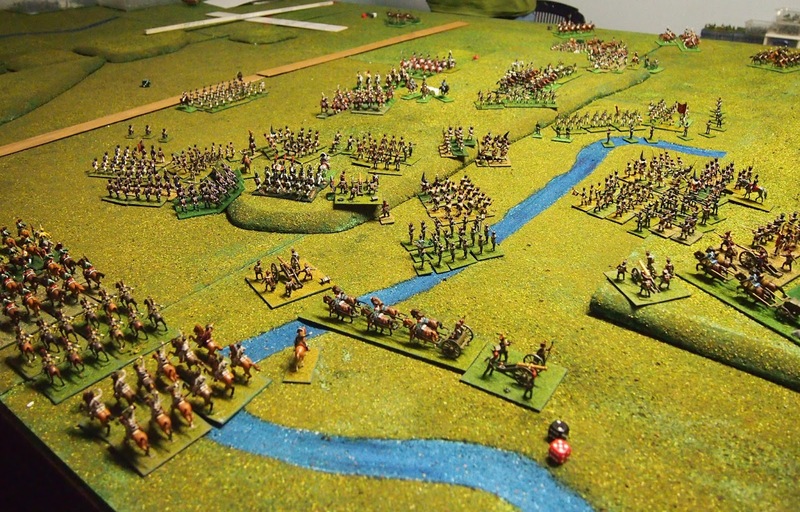 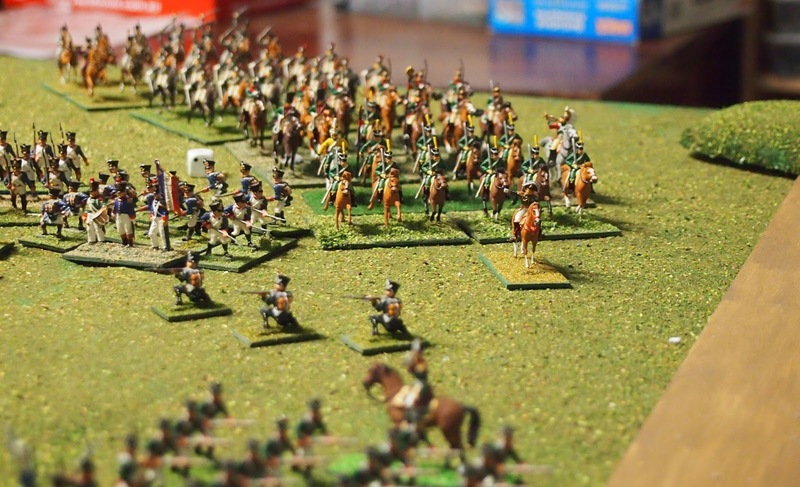 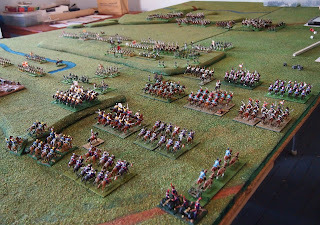 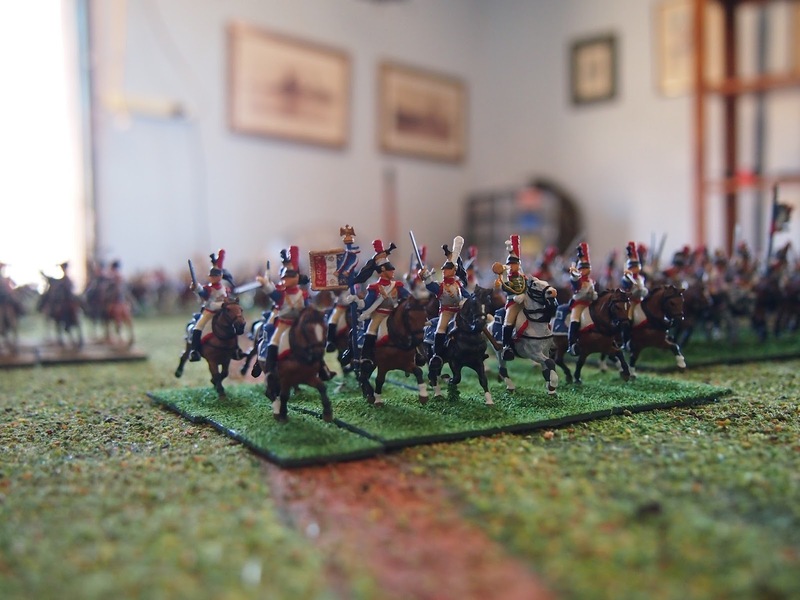 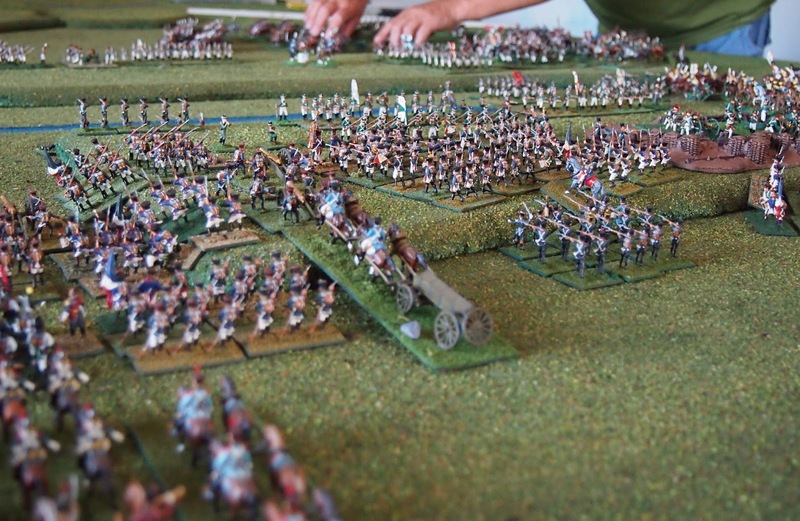 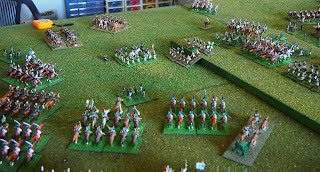 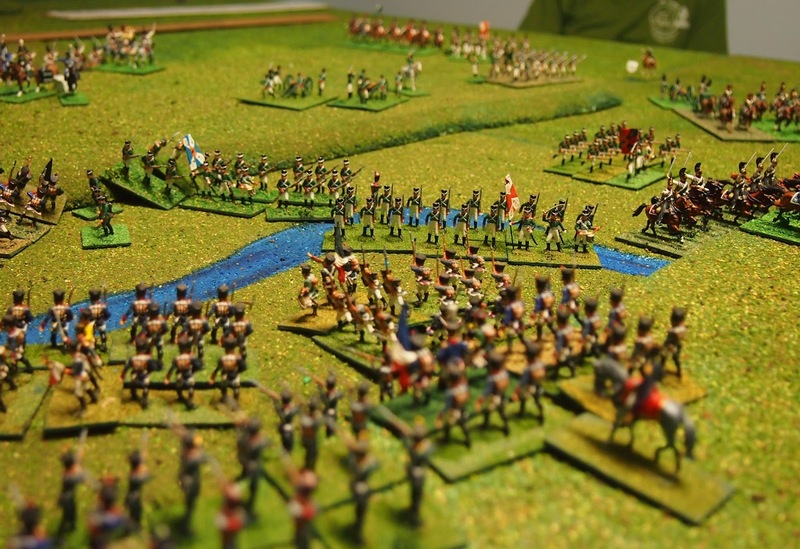 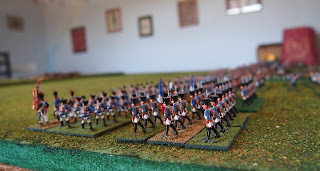 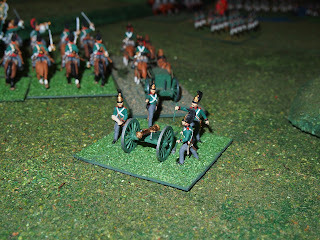 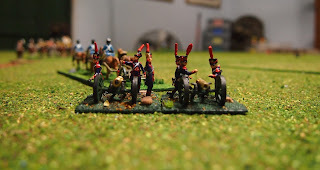 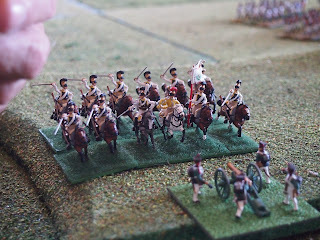 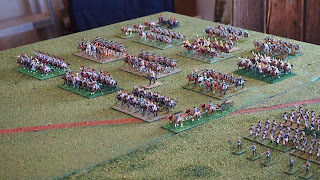 A 'standard' unit is 18 figs for infantry, 12 figs for cavalry and a base for an artillery battery. 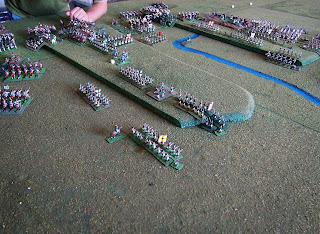 We scale the figure scale up or down from 3:1 to 50:1 depending on the size of the action to generate units from army lists. 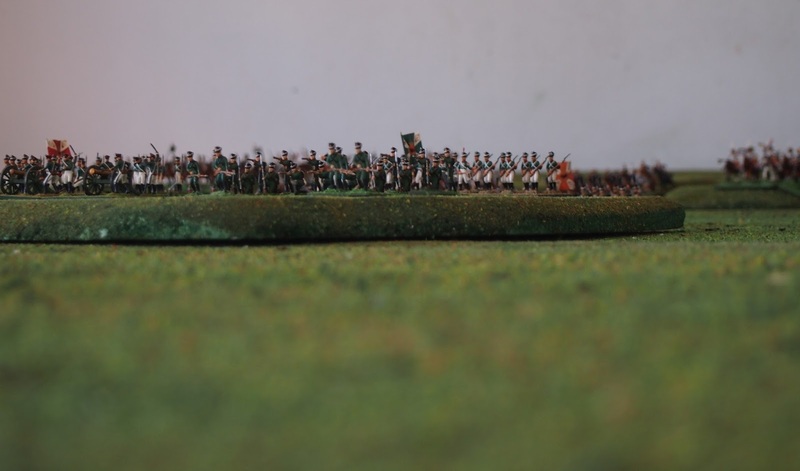 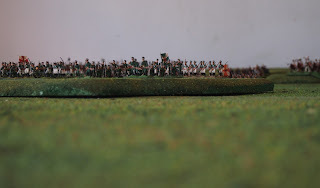 Ground scale is either 1 mm to 1 m or 2 mm to 1 m. We do not adjust the movement or firing if we change the ground scale as we are moving from a unit as about a battalion to a unit as about a regiment and it comes out about right. 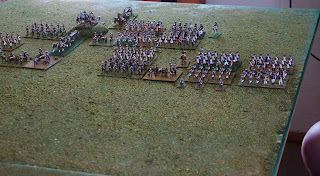 We have found that sticking to one turn being around 30 minutes makes everything work out about right at either scale.